Wipro enjoys instant recognition as an information technology behemoth, but hidden behind the name—an acronym for Western India Vegetable Products Limited—and the company’s sunflower logo are traces of its humble origins as a manufacturer of edible vegetable oil. Founded in 1945 by MH Hasham Premji, father of current promoter-chairman Azim Premji, Wipro began as a fledgling business riding the wave of an imminent Indian Independence. The company grew quietly from strength to strength, single-minded in its consumer care focus as a vanaspati manufacturer. Later, it would diversify into toilet soaps and toiletries. 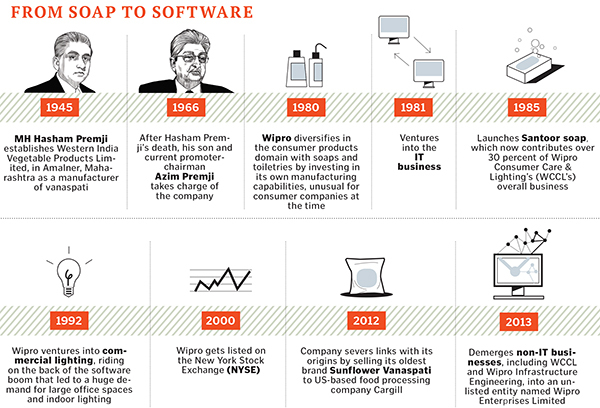 In 1981, Wipro shifted gears and rode the IT boom that would create fortunes for many. It pioneered the marketing of indigenously made personal computers in the mid-’80s, which was a money spinner for the company. Today, at $7.5 billion, the IT business is the younger yet bigger sibling. However, despite living in its shadow, the consumer care entity is no minnow either. Wipro Consumer Care & Lighting (WCCL), though yet to cross a billion dollars in business, grows alongside, a silent behemoth in the making. Over the past 30 years, the Azim Premji-led, and now privately-held WCCL has been building a business that is estimated to be close to a billion dollars in revenue for FY15. It is now present in over 40 countries and is the first homegrown consumer care products firm to report 53 percent of its revenue from overseas markets in FY14. For the same period, Godrej Consumer Products garnered 47 percent of its revenue from its international business followed by Dabur at 32.4 percent, while Marico International contributed about 25 percent to Marico’s overall turnover. WCCL, as a separate entity, germinated from Wipro’s decision to segregate the IT business in December 2012. The move was aimed at creating better shareholder value for its software services enterprise. The hive-off created a separate unlisted entity (Wipro Enterprises Limited) which included two main businesses: WCCL—to cater to consumer care, lighting and office furniture—and Wipro Infrastructure Engineering that manufactures hydraulic cylinders and other high-precision components for the aerospace and defence sectors. Around the same time, the company also severed its links with its origins when it sold its oldest brand, Sunflower Vanaspati, to US-based food processing company Cargill Inc for an undisclosed amount. Wipro’s decision to diversify its consumer care portfolio (from vegetable oil to toilet soaps and toiletries) can be traced to the early ’80s. “In the 1980s, the Indian economy was still under licence raj. Growth could have come through acquisitions or extensions to a new line of business. To expand capacity in the vanaspati unit, we made acquisitions in Gujarat and Karnataka. And this was when we moved into our current product portfolio—toilet soaps and toiletries,” says Suresh Senapaty, former CFO, Wipro Ltd, who joined the company in 1980. During his over-three-decade stint with the company, Senapaty also served as CFO of Wipro Consumer Care in 1982, when it was the biggest business for the group. The metamorphosis into a manufacturer of toiletries was a logical step given the background in edible oils. Wipro invested in its own manufacturing capabilities, which was uncommon for companies in the sector at the time. But the transition had its own share of initial missteps. When Wipro first launched its toilet soap brand Santoor in the home market of Bengaluru in 1985, it sank without a trace. Weak distribution and a sluggish marketing strategy were the chief culprits. This, however, didn’t deter the fledgling Rs 95 crore-Wipro consumer care business from doing the seemingly foolhardy. The brand was re-launched a year later, nationally this time, and without a single change to the product. “Failure was simply not an option. At the time, all toilet soap brands were manufactured by third parties. The barrier to exit the business was low for most, given the low investments, but not for us. We had invested in our own manufacturing capabilities, given our background in edible oils. We went ahead despite the naysayers, confident in the product and ourselves. This, I think, was the start of our transformation,” says Vineet Agrawal, chief executive officer, WCCL. In 1980, about 90 percent of the consumer division’s revenue came from Sunflower Vanaspati, largely from Maharashtra and Madhya Pradesh. Today, WCCL’s Santoor brand contributes over 30 percent of its overall business. It is the third-largest brand in the toilet soap category in India, with a market share of 9.5 percent, behind Hindustan Unilever’s Lifebuoy and Lux. According to market intelligence firm Euromonitor International, the Indian beauty and personal care market was estimated to be around Rs 65,000 crore in 2014 and is expected to cross Rs 1,20,000 crore by 2019. Santoor is a significant player in this market, leading the toilet soaps category in key states such as Andhra Pradesh (the biggest market for Santoor in India where it enjoys a 41.2 percent market share), Karnataka, Maharashtra and Gujarat. However, brand experts feel that despite a varied mix of products in its portfolio, most of WCCL’s brands are strong only in the southern and western pockets of the country and are yet to establish their dominance in the northern and eastern markets. “At the same time, Santoor is the third largest toilet soap brand in the country despite the fact that its presence is largely regional. Wipro needs to push ahead in its under-penetrated markets,” says Harish Bijoor, brand strategy specialist and CEO, Harish Bijoor Consults Inc, a Bengaluru-based brand consulting firm. A Mahendran, chairman and managing director of Global Consumer Products Private Limited, points out that for WCCL, the ‘jewel in the basket’ is Santoor. “But, unfortunately, the soap brand is localised and strong only in certain markets. The brand is yet to penetrate deeply across the country. But, I think, now Vineet’s plan is to take Santoor across all states,” adds Mahendran, who is also the former managing director of Godrej Consumer Products Limited (GCPL). The challenge for WCCL will be its ability to put together a power portfolio of offerings in different consumer care segments. “It is not enough to have one killer offering in the form of Santoor. It needs other big beach-head brands with distinct identities of their own to offset the dependence on Santoor and its numerous brand extensions,” says Bijoor. Even as the industry weighs in on the future of the business, in the last four years (2010-2014), WCCL has grown at a compound annual growth rate (CAGR) of 21 percent clocking a revenue of Rs 5,025 crore (about $837 million) for the fiscal year ended March 2014; EBIT during the period stood at Rs 575 crore. The company has to record a revenue of around Rs 6,300 crore for FY 2014-15 to cross the billion-dollar threshold, which will be a 26 percent growth over the previous year. CEO Agrawal, however, shies away from disclosing how far the company is from this milestone as well as the financials for the recently concluded fiscal. WCCL is expected to announce its FY15 earnings during its board meeting scheduled to be held in the early part of June. WCCL’s healthy balance sheet and a strong annual cash flow has ensured a buffer from currency volatility and allowed the company freedom of operation. The organisation generates a cash flow of close to Rs 400-500 crore a year. At the time of the demerger, the WCCL business had around Rs 1,700 crore in cash reserves. “It’s always easier for an unlisted company to undertake acquisitions, as no investor buy-in is required. However, as an organisation, the board keeps checks and balances in place. We have not acquired any company since the demerger, which I think highlights the risk approach we take to growth,” says Agrawal, who is also executive director at Wipro Enterprises Ltd. 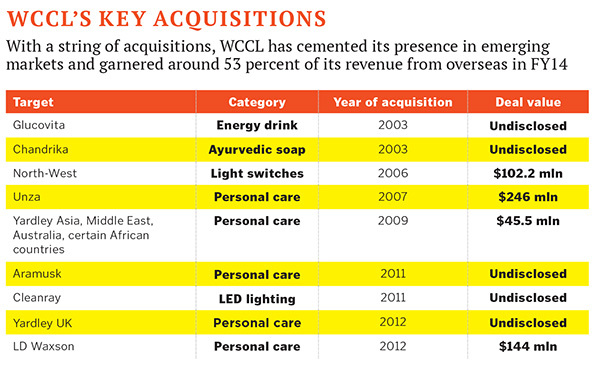 Thus far, WCCL has made eight acquisitions across the personal care and lighting space in India and in overseas markets. The Singapore-based Unza Holdings buyout in 2007 for $246 million in the personal care category has been its largest deal till date. It wasn’t all smooth sailing. “We had to work very hard to build our credibility as a brand in international markets. In some countries, being taken over by an Indian company is looked down upon. They would rather be acquired by a European or US company,” says Agrawal. At a time when ‘brand India’ wasn’t fully appreciated, Wipro had to work doubly hard to prove itself as a leader with world-class products and a vision in the consumer care space. To seal its foreign acquisitions, WCCL had to demonstrate its long-term intent, that it was not a mere ‘fly-by-night’ operator. 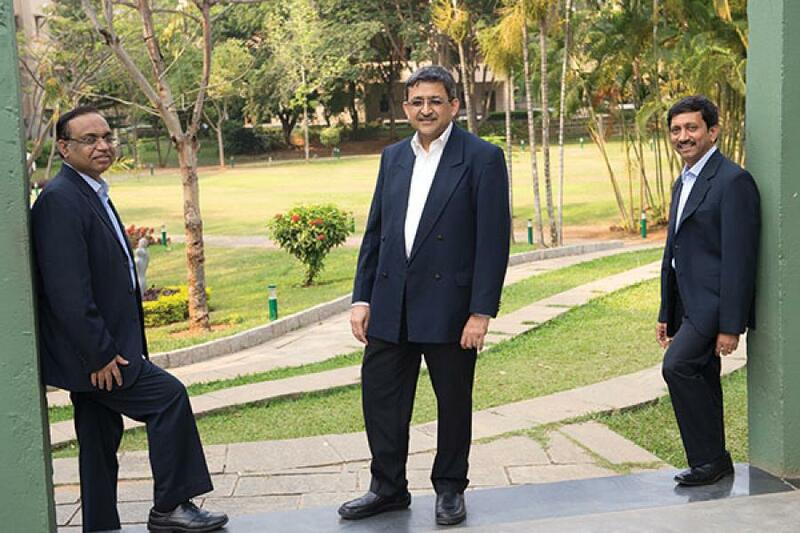 During its Unza takeover, the management flew down the top 100 employees of the Singapore-based company for a five-day induction programme to Bengaluru. On the agenda was one thing—India. The delegation was immersed into all things Indian—culture, heritage and traditions. Trips were made to showcase the wealth of Indian history, including the Taj Mahal in Agra and the Amba Vilas Palace in Mysore, the seat of the Wodeyar kings. For people who had never seen India, this initiative was an eye-opener and, also, helped cement Wipro’s equity as a global leader. Experts point out that for WCCL, all its buyouts worked out well and fulfilled its objective of a strong overseas foothold, even with large deals such as Unza and Singapore-based FMCG company LD Waxson Group, which was acquired for $144 million in 2012. The firm has managed to cement its presence in emerging markets such as Malaysia, China, Indonesia, Vietnam and Singapore with its string of acquisitions. For WCCL, India constitutes about 47 percent of its total sales and Malaysia is close to 25 percent, making it the second-largest market for the firm in terms of overall sales. It has also expanded its base in mature markets by acquiring Yardley’s UK and Europe business (excluding Germany and Austria) and the UK-based heritage personal care brand Woods of Windsor. It also grew its Indian portfolio by acquiring brands like Glucovita, Chandrika, Aramusk and North-West Switches. “Acquisitions, more than exports, have driven the business outside India for WCCL. In recent years, it has moved to buying significantly larger-sized businesses (like Unza and LD Waxson) that already have a wide international footprint, giving further momentum to the growing share of overseas markets in the company’s overall sales,” says Devangshu Dutta, chief executive, Third Eyesight, a New Delhi-based retail and consumer products consultancy firm. “The overseas acquisitions are of those businesses that have an emphasis on emerging rather than mature markets. Many of these emerging markets are under-penetrated and have possibly helped Wipro to buffer any potential growth slowdown over the last 2-3 years in the highly competitive domestic market,” says Dutta. Wipro became the second-largest personal care company in Malaysia two years ago, ahead of global giant Procter & Gamble (P&G). At present, Unilever leads the market in Malaysia. In Vietnam, Wipro is the third-largest player just behind Unilever and P&G, while in Singapore, it is the second-biggest player in facial skincare with a 14 percent market share and leads the facial cleansers category with 15 percent. “If we have to grow faster, we have to set a target higher than the industry growth rate. The India and Saarc market has grown from Rs 270 crore in FY04 to Rs 1,565 crore in FY14, a 19-20 percent CAGR over the ten-year period. During the same period, the FMCG industry in India, has grown in the range of 10-12 percent,” says Anil Chugh, chief executive, (consumer care business), WCCL. Chugh, who heads the consumer care and Yardley business for India, Bangladesh, Nepal and Sri Lanka, says the growth has been both organic and inorganic across markets. “When we acquired the energy drink brand Glucovita in 2003, it was an approximately Rs 4-4.5-crore brand in terms of revenue; today it clocks over Rs 40 crore. We acquired such under-utilised brands and have grown them significantly,” he says. 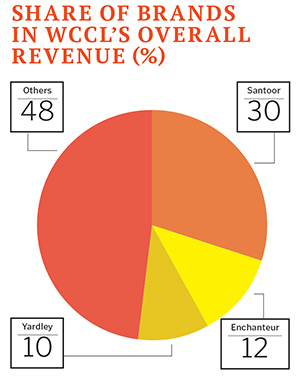 While Santoor is the current cash cow for the business, WCCL also operates other fast-growing categories. Its lighting and furniture businesses garnered revenues of around Rs 703 crore in FY14, which is 14 percent of the company’s overall revenues. The company first ventured into the commercial lighting space in 1992. The institutional lighting division began three years later. “Liberalisation helped us grow the lighting business. The software industry was booming, large office spaces were opened and the demand for lighting skyrocketed. We focussed on the offices rather than outdoor lighting,” says Agrawal. In the last three years, Wipro’s consumer lighting business has grown at a CAGR of 20 percent. Even as the business keeps its eye on the ball, WCCL has invested strongly in areas critical for success: People, processes, and its sales and distribution muscle. WCCL has, as its core team members, people who have been part of Wipro for many years—a rare feat. Agrawal himself joined Wipro as a newbie campus recruit after his MBA from Jamnalal Bajaj Institute of Management, Mumbai, in 1985 and has stayed on, moving to lead WCCL in 2002. Chugh has spent 25 years with the business, while Kulkarni has completed two decades with the organisation. 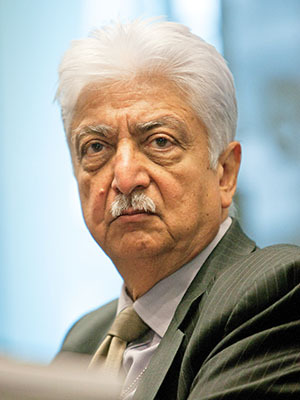 Wipro Enterprises Ltd is led by non-executive chairman Azim Premji, while its board includes Suresh Senapaty, Vineet Agrawal, Pratik Kumar, CEO of Wipro Infrastructure Engineering, and Rishad Premji, elder son of Azim Premji and chief strategy officer, who was recently appointed to the board of Wipro Ltd.
Azim Premji, the 69-year-old billionaire promoter of Wipro Ltd, keeps a day dedicated every quarter for WCCL. He plays an active role in all major decisions of the company such as strategy and operational planning, capital expenditure and acquisitions. His involvement in the business also extends to interactions with some major clients and WCCL’s employees. WCCL has a total staff strength of 8,300 people, of which about 5,600 are stationed outside India. Research and development (R&D) is another key ingredient for fuelling the company’s growth. As Wipro plans to scale its consumer care business globally, innovation will play a vital role. “We launched Glucovita Bolts, a first time product with Glucose which can be taken on the go (without water). We struggled with the formulation and packaging because it was the first time that such a product was conceived and made. However, it was worth it as it has been a success. Safi Shayla shampoo in Malaysia is a specially formulated shampoo for hijab-clad women. In the first year itself, it has garnered a seven percent share in Malaysia. Without innovation, one will never become a leader,” says Agrawal. While the company doesn’t disclose its R&D budgets, it operates R&D centres in India, Malaysia, Vietnam, Indonesia and China. It also has centres of excellence in India and Malaysia. Debashish Mukherjee, partner, co-head, consumer and retail industries, India and Southeast Asia, AT Kearney, feels the marketing and distribution minds of some of the multinationals have earned them a very high market share. “A strong distribution channel and building brand awareness through a huge advertising budget makes the difference for any brand. That’s where most of the international players score over local peers. There’s not much differentiation in product quality or pricing,” says Mukherjee. WCCL, to that end, is bolstering its distribution to compete on a national level. It has 30 sales offices spread across state capitals in the country along with a network of branch offices. The company claims to have 4,000 distributors across the country, reaching over 7.5-8 lakh outlets directly and with an indirect reach of 18-20 lakh outlets. Senapaty, director on the board of Wipro Enterprises, also points to a push towards a stronger online presence. “It is important to not just be present, but there must also be a strategy for emerging sales channels such as ecommerce. With higher mobile phone penetration and newer experimental models of delivery, FMCG companies must have an active online sales strategy.” He says that WCCL is also looking to capitalise on under-penetrated categories like bath and shower products, deodorants and bodycare. “While per capita consumption in these segments is far lower in India than in other emerging markets, they are growing rapidly and this growth is what the company will capitalise on,” he says. This growth should be one to watch out for because WCCL must show the same foresight and clarity of thought it has done so far to create another Santoor and expand into other markets. Otherwise, and this is a cautionary note, the dream of the next billion is likely to remain just that for the older Wipro sibling. I always admire Group companies like Wipro, Mahindra, Birlas and Tatas - they still have this entrepreneurial spirit in their DNA. I believe this is mostly to do with being a \'promoter\' led organization. Being diversified business houses, they have edge over others, especially competing IT companies, in cross leveraging the business knowledge and their senior leaders. I wish to see Wipro also set up a Leadership Academy similar to what Tata (Tata Administration Academy) and Birla (Aditya Birla Leadership academy) had done.